Success. Your download is on its way. You will receive an email with a download link shortly. Enjoy the rest of the post. Client acquisition costs in the finance space have risen faster than the price of housing in Sydney. In fact, finance industries around the globe are experiencing the pain of watching soaring client acquisition costs. As a result, many companies are now being more proactive than ever at introducing some of the best client retention ideas to slow down their churn rates. You’ve heard countless stats about how much easier it is to sell to an existing client than it is to gain a new client. Client acquisition costs as high as $2,000? What? And with client acquisition costs in the finance industry running so high (some segments are paying up to $2,000 to gain a new client), you can see why many are turning to a proactive client retention strategy. CEOs and the best managers the world over know ‘the real work starts when the sale is made’. Making the sale is step one and we are not playing down the challenge involved there. But once you have a fully engaged, active client, your job is to engage, inspire and challenge them to be the best they can through using your services. Below is a list of 42 client retention ideas to inspire your clients to be thinking of no-one else but you. Create a new series of YouTube videos and put them in a playlist. Create a new page for these and embed the YouTube playlist, so that it updates automatically. Provide this helpful link for your clients so they have one page to access all the specific videos they need for that category. Offer your clients an incentive to refer other clients. For CFD & FX companies, it might mean a $200 trading credit for each of those referred who open a live trading account. Other incentives could be straight cash, brokerage credits, gift vouchers or a nice bottle of Penfolds wine or French Champagne. Run a regular series of trading webinars and be known in the space for that series of webinars. Do you have an analyst who excels at technical analysis? What about an Ichimoku specialist? Host a regular webinar and be known as the go-to person for that niche. Host a Meetup. Meetups are ideal for your local clients. To leverage your time, video the event and then post it to your YouTube channel. This will allow clients from all over the world to view your Meetup. Run a live event or master class and invite a guest speaker (like Dr Marc Faber’s recent MasterClass) to share their wisdom. Introduce a new product that adds value to their experience. Decrease the margin on certain products. For those in the CFD or Forex space, create a schedule for lowering your margins on your popular products. If your margins on certain FX, index or commodity products are competitive, why would they go through the hassle of choosing another broker? Decrease the spread on certain FX pairs, indices or commodities. Spreads are critical for all CFD & FX traders. If all your competitors have 1 point spreads on the main indices, you aren’t going to retain too many clients if you have a 2 point spread. Create a content calendar where you push out content at regular intervals. In addition to this, email your clients to let them know about the new content. So many times we see companies producing great content, only to neglect to send it out to their most important people, their clients. Create a suite of platform tutorials on MT4, cTrader, IRESS or your bespoke platform. Your job is to make the life of the new trader as easy as possible. At times, your clients are going to need help in placing certain orders on your platform. If you have educated them through email that you have all the educational bases covered, they’ll remain loyal to your company and channel. If not, they’ll be running a YouTube search and watching the tutorials on a competitor site. Measure every element of your support team and optimise everything. If on average it takes you 7 hours to respond to a call, then strive to do it in less than 2 hours. Become more engaging on LinkedIn and open more conversations. Respond to posts by people in your industry. Contribute to conversations and win them across to you. Offer a nice gift for your top level clients at Christmas time. As far as the best client retention ideas go, this one takes the cake. Your best clients deserve a little love at the end of the year. Review your FAQs and add or update where necessary. Try and provide as much information as possible for your clients so they have all the key answers to their questions. The easier you make the life of your clients, the more likely they are to stay with you. Introduce a loyalty program whereby they get certain rewards the more they trade. This would have to be the big one. If you can introduce a loyalty scheme where they attract points for all their trades, engagements and referrals, then they remain loyal and stay with you for longer. Encourage reviews from your clients. People are sceptical by nature. If you have people who are raving about you and your company, ask them to add a review on your website, Facebook page or via video. People will be able to scan through the reviews at their leisure, further building your credibility. In the Forex space, there are many excellent forums which allow clients to post a review. Forums like this one, this one and this one. Be proactive in using these as they always rank highly in the search engines. Every three months, create a new customer survey. Survey’s make your customers feel as though you care about them. Genuinely ask what it is they need to get to the next level and then follow through and provide the new information. Write a strong follow-up email sequence. Your sales teams are likely very busy, and prospects fall through the cracks. With an effective follow-up sequence, the chance of your new prospects fallling through the cracks will be reduced. Implement a call back follow up system that is part of your sales persons’ daily routine. Introduce Marketing Automation and start segmenting your lists based on the actions they take on your website. This client retention idea works by only offering your clients information on their interests. You will be sending out fewer blanket emails and more tailored offers. If you aren’t already, create a custom audience on Facebook with all your existing clients. Run ads that are specific to them to nurture their current position or which allow them to upgrade their experience. Allocate 10% of your marketing budget to serving existing clients. Got negative reviews? Address all negative reviews with a video explaining the situation and what measures you have taken to rectify the situation. Get all your staff to update their LinkedIn (LI) profile, especially your analysts. Potential clients will be looking over your LinkedIn profiles before they make a purchase. Make sure all staff and especially management, keep their LI profiles up to date. If a client asks a question about your platform, or how to apply an indicator or something around technical analysis, put together a video tutorial and post it to YouTube. Then send the person the link to the new custom video created just for them. People are not expecting that level of service. Your retention rates and trading volume will increase as a result. Become an ‘ideas machine’ company. At the start of every month, get the team together for 20 minutes and ask the question ‘what can we do better?’. These ideas can form the basis for your client retention strategy. Create a better sign up process. Be constantly on the lookup for ways to improve and make your sign-up process more efficient. If you start the customer journey smoothly, clients are likely to remain with you longer. When it comes to FX traders, be on the lookout for new Expert Advisors (EAs) worth reviewing or highlighting. Run a review and introduce the world of automated trading to your client base. Interview your best clients. Provide these interviews as new blog posts or podcasts. Create a new eBook or blog posts with specific stats and analysis they have not seen before. PsyQuation does a great job of this here and here for example. Coach your company CEO, Managing Director, head analyst or other staff to get on TV. TV positions you as the authority. Your clients love to explain to others how their ‘team’ is the best in the business. This not only acts as one of the best client retention ideas but helps build referrals too. Introduce a VIP program. Traders will have to meet turnover requirements to unlock certain rewards. By meeting certain criteria, they get access to holidays, special events or one on one time with high-level traders or coaches. Create a regular PR and Media campaign that gets your name out in the marketplace regularly. Manage client expectations. Outline what it is clients can expect when dealing with your company. Nothing ends a relationship faster than over promising and under delivering. Be real about your expectations, and you’ll retain your clients for longer. Engage your staff and offer them incentives to improve company policies and make the client experience more efficient and rewarding. Introduce a more powerful way for your higher-level managers, institutional team and key staff to establish strong relationships. When it comes to institutional business, relationships are everything, so nurture your relationships like nothing else. Once a quarter put out a fresh piece of research in an eBook but complement it with a webinar recording that is only available to your VIP clients. If you haven’t already, send out a regular newsletter. Focus on quality education and topics that are of great interest but always drop in a small amount of company promotional material. Make sure any promotional material makes up only a small slice of your newsletter. 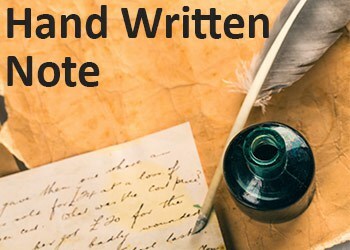 Get your CEO or head analyst to write a hand-written note to your top 20 clients. The CEO doesn’t have to do the handwriting. Get one of the team to do that, but make sure the note is personal and heartfelt. Know the lifetime value of your client. Use this information to be more precise with how much you can spend to acquire the client initially. Then once they are a client, you should also invest a portion of the revenue generated to invest in them. By knowing your numbers you can have confidence in how much value you can provide to existing clients. Write up a case study on your best clients, highlighting what they have been able to do by working with your company. Email your clients weekly ideas on new entry techniques and trading strategies. If you are not a trading or broking business, then think up other ways to inspire your clients with new ideas on using your products/services. With all FX and CFD brokers, the ultimate trick is to get clients started. Devise strategies or video tutorials to help walk the newbie through placing their first trade. Make their entry into the markets with you as easy as possible. How are you developing your raving fans? What methods do you have in place to develop loyal customers? By implementing a handful of the best client retention ideas in your business, you should see your churn rates go down, and the amount of repeat business go up. If you haven’t already, discuss the idea of establishing a client retention champion in your business. A customer-focused employee who cannot think of anything else but make the lives of your clients better. Client retention is too important to do ‘every now and again’. Instead, dedicate resources to it and make it a full-time commitment. Your business may depend on it. Would you like to dive straight in and focus on the best client retention ideas? 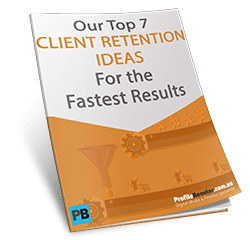 Download our Top 7 client retention ideas for the fastest results. Your are in. You should receive your email download link within the next few minutes. Enjoy.